What: Kimberly Willis Holt will discuss and sign her newest novel for kids, Dear Hank Williams. When: Tuesday, April 14, 5:00 pm Where: Blue Willow Bookshop, 14532 Memorial Drive, Houston, TX 77079 Admission: In order to go through the signing line and meet Kimberly Willis Holt for book personalization, please purchase Dear Hank Williams from Blue Willow Bookshop. At the time of your purchase, we will issue a signing line ticket that indicates your place in line. Your book and signing line ticket can be picked up at the event. About the Author: Kimberly Willis Holt is the author of the many award-winning novels for young adults and children, including THE WATER SEEKER, MY LOUISIANA SKY, and WHEN ZACHARY BEAVER CAME TO TOWN, winner of a National Book Award for Young People's Literature. 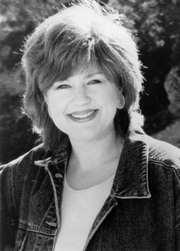 She is also the author of the bestselling PIPER REED series of chapter books and several picture books. Holt was born in Pensacola, Florida, and has lived all over the world--from Paris to Norfolk to Guam to New Orleans. She now lives in Texas with her family. Book: It's 1948 in Rippling Creek, Louisiana, and Tate P. Ellerbee's new teacher has just given her class an assignment--learning the art of letter-writing. Luckily, Tate has the perfect pen pal in mind: Hank Williams, a country music singer whose star has just begun to rise. Tate and her great-aunt and -uncle listen to him on the radio every Saturday night, and Tate just knows that she and Hank are kindred spirits. Told entirely through Tate's hopeful letters, this beautifully drawn novel from National Book Award-winning author Kimberly Willis Holt gradually unfolds a story of family love, overcoming tragedy, and an insightful girl learning to find her voice. Ordering: A limited number of autographed copies of this book will be available for purchase after the event. If you cannot attend the event, and would like a personalized copy of a\ book, please call us before the event at (281) 497-8675. If you can't attend the event or need a copy shipped to you, you may call the store or add the appropriate book to your cart on our website. Payment type must be "CreditCard." In the order notes, add personalization details. To place an international order, please email orders@bluewillowbookshop.com to obtain shipping details and to have items shipped to you. Staff will respond within 24-48 hours. Teen after hours book club for ages 13 to 18 meets monthly to discuss two books. Teens get 15% off selections! Kimberly Willis Holt is currently considered a "single author." If one or more works are by a distinct, homonymous authors, go ahead and split the author. Kimberly Willis Holt is composed of 2 names. You can examine and separate out names.